Staff at a Devon newspaper spent a night sleeping on the streets to raise money for a local food bank. The team from the Midweek Herald bedded down in a Honiton car park to raise money for The King’s Centre Food Bank. Editor Belinda Bennett said: “I don’t think I’ll rush to volunteer to sleep on the streets again, but it has been a worthwhile exercise for a deserving cause. “The economic downturn has really hit some local families and, for a few, keeping a roof over their heads means they can’t afford food. 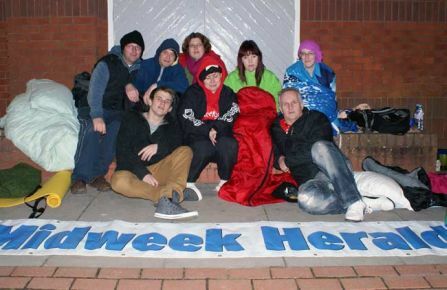 The brainchild of advertising executive Claire Pearce, the sleep out has raised hundreds of pounds for the food bank, which fed 25 families in the five weeks following its launch. Reporter Katy Griffin said: “It was a humbling experience. It made me appreciate having a roof over my head and a bed. Others taking part in the sleep-out included Tim Mortimer, Matt Jenkins, Dave Somerton-Rees and Alex Walton, and local councilor Sharon Pavey. The group didn’t get much sleep after being woken up by a blackbird singing at 3.20am. We did – it’s just taken a while to get on here! Of course there are now quite a few ex-journos sleeping rough for real.